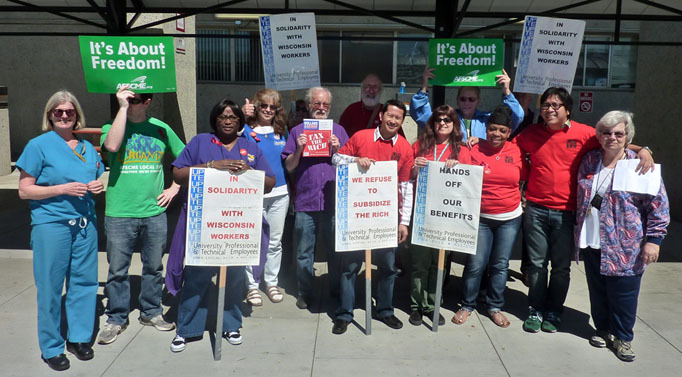 Hundreds of thousands of workers demonstrated across the nation last Monday, April 4, on a national day of action called to support the bargaining rights and unions of workers in Wisconsin and elsewhere. For instance, thousands of chanting marchers poured into San Francisco's Financial District at rush hour, shouting "Tax the Rich! Tax the Rich!" – among them UPTE’s Nino Maida (in red t-shirt at far left). Demonstrations also took place on several UC campuses, such as this one at UCSF. From the Bay Area to Southern California, public workers have come out recently to make their voices heard. UPTE members’ photos are included in this gallery from our national union, the Communications Workers of America. Staff and faculty at the California State University system will be taking a class action on April 13 to defend bargaining rights and quality education at their 23 campuses across the state. At UCSD, a plan to create a law school with California Western School of Law has been shelved at least temporarily. Are UC faculty deserting a sinking ship, or are these defections perfectly normal? Last week, UC Berkeley Dean of Biological Sciences Mark S. Schlissel was named the 11th provost of Brown University. And another UCB professor, mathematician Vaughan F. R. Jones, will become a distinguished professor of mathematics at Vanderbilt University beginning in fall 2011. Jeff Colvin, staff physicist and an UPTE member at Lawrence Livermore National Laboratory, spoke at Los Alamos National Lab last week about the effects of privatization on the labs.